Fuzzy Thoughts: is it too early? Can I mention the C-word? My wonderful husband has spent the last few weekends working on a big surprise for all of my fans. (I helped a little with the editing, but he really did the worst of the work) We now have a pattern book! Woo hoo! I am really excited about this, because it's an idea we've talked about for months. Only lots of pressure and late nights managed to get it done in plenty of time for Christmas shoppers. We imagined it as a gift for people who love to knit, and love cute cuddly things. Of course, if you want it just for yourself, that's okay too :) The book has 12 toy patterns, plus a little bonus, and you can get it in printed book form or as a pdf file. We ordered an early copy, and it's so special to be holding our book in my hands, with lovely colour pictures and everything! Posted by Barbara Prime at 6:16 a.m.
November 8, 2007 at 8:12 a.m.
November 8, 2007 at 8:44 a.m.
November 12, 2007 at 6:16 a.m. 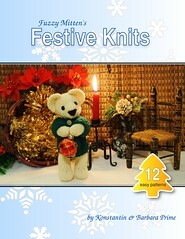 I was just wandering if you have any plans to re release the festive knits as a pdf file as i would like to buy a copy. June 3, 2008 at 9:31 a.m.
gingerspice: My newer Fuzzy Knits book has all the same patterns as the original Festive Knits, and you can find it here. June 3, 2008 at 4:43 p.m.